More details have emerged about the new sixth generation of the BMW M3 just as the German premium practically announced the end of the current-gen 3 Series with the unveiling of the track-focused BMW M3 CS. As reported by the Car Magazine, the next generation of the BMW M3 has a codename of G80. The next BMW M3 is bound to be introduced in 2021, around three years after BMW launches the new generation of the 3-Series saloon (codenamed G20) in 2018. The 3-Series saloon will be followed by the 3-Series Touring (G21) in 2019 and by the 4-Series coupe and convertible (G22/23) in 2020. The next generation of the M3 is expected to don the tweaks implemented on the 3-Series. These tweaks are seen to include a wider track, a lower center of gravity and a longer wheelbase, as well as a more stable aerodynamic balance and more user-friendly ergonomics. Its design is expected to be expressive, with a number of unique elements to distinguish the G80 M3 from the current generation F80. As for power, the sixth generation of the M3 is seen to retain the twin-turbo 3.0-liter inline-six engine that powers the current model (F80). However, this application of the turbocharged engine will be more powerful than those on the current base M3 and the upcoming M3 CS. As reported, this twin-turbo 3.0-liter inline-six engine could deliver a power level at par with the mill of the limited-edition M4 GTS, which could generate 493 bhp at 6,250 rpm and 442 lb.-ft. at 4,000 rpm. To make this powerful engine compliant with stricter emissions regulations in the future, it makes use of a 48-volt electrical system, a particulate filter and a start/stop system as well as employ mild hybridization and a coasting mode in its most eco setting. BMW M is seeking to make the next-gen M3 much lighter than the current iteration. However, the division would have to deal with the extra weight brought by the water injection and the standard-fit aerodynamic kit that includes bigger ducts and deflectors. M engineers would also have to offset the extra weight brought by the heavier 19- and 20-inch wheels and tires. During development, BMW M will try to achieve a better balance of low drag and high downforce while gaining higher levels of traction. The new M3 is expected to feature the so-called iD7 infotainment system with around three interactive displays. According to Car Magazine, the sixth-generation M3 would likely come optional with an on-demand all-wheel drive system that is less complex than the xDrive system on the 2018 BMW M5. The new M3 would also feature an electrically assisted steering, electrically operated side-to-side locking differential, adaptive dampers and a lightweight brake-by-wire system with four individual electric actuators. I wonder what the 48V accessories are and whether it is an optional trim or not. Dont know how true all that is, but if it is, well, there goes the last fun car from BMW. iirc 48-volt is for e-turbos... for reducing lag on the low-end. You can also have 48V starter generators, 48v axles, 48v A/C and power steering, etc. It depends what they wanted to spend money on. True, but 48v isn't needed for any of those except for e-performance things or even more electric gadgets in the car than what's currently the norm. Personally, I don't think they'd switch/add electrical systems unless there's some kind of electrification for driving enhancement/performance happening... But who knows... manufacturers can do whatever they want I guess lol. What's the life cycle of the particulate filter? IIRC, they even use the 48V starter as a hybrid motor for boosting output when desired. Don't worry about it, that's for Europe due to tighter particulate standards. From here on out the US cars will be the ones to buy. They have 12 volt e turbos. They're not quite in production yet, but they are available. I would be surprised if they go 48V and only have an e turbo. There's not much efficiency benefit to that to meet regulations. They will probably have at least 2 devices. First-ever X3 M will usher in the new S58 engine. Sources familiar with BMW’s agenda have disclosed a new powerful gasoline engine is in the making and it will be put to good use in a multitude of models, starting off with the X3 M. Codenamed “S58,” the six-cylinder turbocharged unit won’t be a completely new engine as it will be more of an evolution of the existing S55 3.0-liter mill you’ll find in the M3 and M4. While the M3 you can buy today pumps out a meaty 444 horsepower when fitted with the optional Competition Package, the new engine is expected to up the power ante to somewhere in the region of 470 or up to 475 hp. But first, the S58 will find its way inside the engine bay of the highly anticipated X3 M set to take on the likes of Mercedes-AMG GLC 63 and the Audi SQ5. Logic tells us that its coupe-ified counterpart, the X4 M, will be blessed with the same engine. Things could get a bit more complex in the case of the next-gen M3 as a different report indicates it will take advantage of a mild hybrid system lifting total power to as much as 500 hp. Besides packing more punch, the new M3 – and its M4 coupe and convertible siblings – will make a more generous use of carbon fiber to shave off weight and consequently boost performance furthermore. Expect the S58 to premiere as early as next year in the first-ever X3 M, with the X4 M to follow shortly. Believed to get an optional xDrive all-wheel-drive system, the new M3 is slated to debut around the end of the decade and it probably won’t take too long before its two-door cousins will be out. Last edited by Masterauto; 12-26-2017 at 11:55 AM. The next-generation BMW M3 – due for launch in 2020 – is expected to use an extensively updated version of BMW’s twin-scroll turbocharged 3.0-litre straight-six engine producing around 465bhp. Officials at the 2018 Paris motor show, including company boss Harald Krüger, confirmed that a new M3 was under development, although they declined to give details. It is understood, however, that engineers have been set the target of giving the new M3 a power boost over the M3 CS, which produced 454bhp. It is believed the additional performance is likely to come from the use of a water injection system, like that used by the M4 GTS, to enable reduced cylinder temperatures for more efficient running. The only obstacle to this system being employed is believed to have centred on the issue of effective packaging, but that is now thought to have been overcome. The additional weight of the water injection system is minimal and unlikely to compromise BMW’s goal of making the car lighter than the 1585kg M3 CS. This is thanks to the savings already made with the basic structure of the new 3 Series, as well as the potential benefits of using carbonfibre parts, including the roof. Both a four-wheel-drive system, similar to that used on the M5, and any form of electrification are believed to have been vetoed because they would add too much weight, complexity and cost. However, persistent reports suggest that the 2020 M3 could be the final M model to be launched without some form of electrification, which is necessary due to the increasing priority of meeting fleet-average CO2 targets. There are no further details about the new M3’s potential performance, but the lighter, more powerful car will eclipse the current M3 CS’s 0-62mph time of 3.9sec. It will be sold with a choice of six-speed manual gearbox or optional eight-speed automatic, but the auto will enable the better performance figures thanks to a built-in electronic launch control system. The M3 will also benefit from the increased rigidity offered by its part-aluminium, part-high-strength steel CLAR underpinnings. This is a key reason why BMW is already making class-leading claims about the dynamic abilities of the base 3 Series. The regular car’s wider track and uprated suspension systems should also give engineers the foundations for a dynamically more capable M3. As well as offering greater performance potential, the stiffer chassis should reduce the amount of vibration transmitted into the car to enhance overall refinement. It should also allow engineers to adopt softer spring rates to give the M3 a more compliant ride in its most comfortable mode without hampering the car’s overall dynamic ability. Inside, the next M3 will follow in the M5's footsteps and swap its dashtop infotainment screen for one that’s more tidily integrated into the dashboard. The iDrive system is expected to retain a rotary control knob because it has been praised for its ease of use in current cars. The M3 will also gain significantly more advanced driver assist features, but former sales and marketing boss Ian Robertson has hinted to Autocar that most BMW models will steer clear of the full autonomous hardware suites to be used on i5 and i7 due from 2021. M models, in particular, will still possess a very driver-centric character. The M3 will continue to form the basis for the technically identical M4 coupé, while M-worked 3 Series models will lend their hardware to a two-door M440i M Performance coupé and M440d M Performance coupé. These models are also due to arrive in showrooms in 2020 and are part of a 26-model onslaught of M division-tuned cars that aims to more extensively rival the growing ranges of Mercedes-AMG and Audi Sport. It remains uncertain whether the car will feature an active rear-wheel steering system to enhance agility and boost high-speed stability. Although it is under consideration, the business case for developing the system for the M3 only is believed to be under debate. The car, now testing on public roads in development form and due to go on sale in 2020, would inherit the active technology from the 5 Series and 7 Series. If the hardware does make the cut and is fitted to the super-saloon, the M3 would be the only car in the upcoming 3 Series range to feature it. My personal preference is always for RWD as there's no AWD system that can truly offer the fun factor of RWD. However we are getting to the point where the engines in a lot of these cars are overpowering the rear wheels. They had to change the torque curve of the S55 engine because the early F80/83 M3/M4 were too unruly so it will be interesting to see how the characteristics of the new models differ between AWD and RWD. I will reserve judgement for when we have enough evidence to support which setup is superior on the new cars. Eh, if I had only 1 fancy car as a DD I could spring for the M3 in 4wd during snow season. Have you guys not seen the chart? 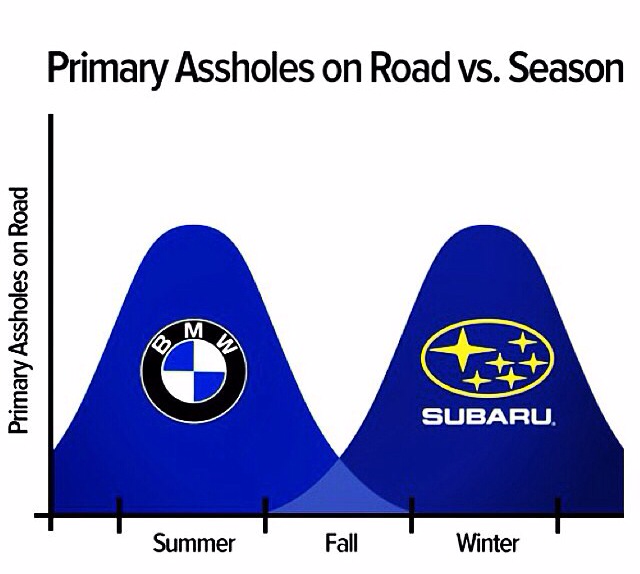 BMW drivers get to be A$$-holes in the summer, WRX owners get to be A$$-holes in the winter; we already share fall and spring. BMW’s new M3 is scheduled to debut later this year at the Frankfurt motor show, but this hasn’t prevented Carsten Pries, BMW M’s head of product planning, confirming the powertrain that will be used to power the M division’s rival to AMG’s C63, Audi’s RS4 and Alfa’s Giulia Quadrifoglio. Debuting in the new X3 M and X4 M SUVs is an all-new 3-litre, twin-turbocharged straight-six mated to an eight-speed double-clutch gearbox and the company’s latest xDrive all-wheel-drive system. And once the X-cars appear on the roads later this year, BMW M will turn its attention to readying the new M3 with the same powertrain. Yes, this does mean the next M3 is to be four-wheel drive. Sorry about that. The new straight-six will, like its rival AMG V8, be offered in two states of tune: in this case 480 and 510bhp, the latter badged Competition. Both will make 442lb ft of torque, and it’s likely that, as with the X3/4 M, only Competition models will make it to the UK. And if the thought of a four-wheel-drive M3 brings a tear to your eye, try not to be too disheartened, because while the X3/4 M are fitted with an adapted M5 xDrive system but without that car’s rear-drive-only mode, the M3 will get the wizardry that allows you to send every last bhp and lb ft to the rear wheels alone. Also carried over to the new M3 will be the latest evolution of the M5’s electronic steering that will be developed to suit the M3’s lower weight (expect it to tip the scales at around 1600kg). There will also be a more dynamic approach to its chassis set-up, achieved by fitting the latest active damper system from the M5, optimised to benefit from the M3’s new bespoke front and rear subframes. The car will also have a stiffer front strut brace and additional engine bay bracing, a principle that will also debut on the new X3/4 M models, as will all of the aforementioned hardware. The new M3’s standard brakes will have four-piston calipers at the front with a 395mm disc, although unlike the two new M SUVs the saloon will also be available with BMW M’s latest generation of carbon-ceramic brakes. Expect 19- and 20-inch wheel options (the X3 and X4 Ms will have 20s and 21s), and Michelin’s Pilot Sport 4 S tyre as the standard offering. There could, however, be a rear-drive, manual-gearbox light at the end of the tunnel. In the past, M’s CS models have been the most powerful, quick and focused offerings, but there is a suggestion that a new M3 CS could focus less on performance and more on a purer driving experience. This would be achieved by offering a rear-drive, manual model, whose turbocharged six would produce less torque (and subsequently power, too) to preserve the gearbox’s internals, but would also shun some of the complex – and heavy – technology that burdens modern performance cars. It sounds like an M3 evo would build. Hopefully BMW will, too. What if I wanted to be ******* in Summer, Spring, Fall, and Winter? The M3 seems like the most reasonable choice. That is just plain logical man! well done!